A chance to tell Chicagoans that being good to the environment is good for your wallet. That's how the City of Chicago viewed the 2008 Chicago Green Festival. Terracom was part of a team, headed by WRD Environmental and including the marketing firm Torque, that the City tapped to create its 2,000-square-foot festival pavilion. Terracom was project manager for the fast-track project. It also wrote all copy for the pavilion, drawing on tips the city had prepared, knowledge of the sustainable lifestyle and familiarity with the city's many green programs to engage visitors in green living. Most importantly, Terracom encapsulated the pavilion's theme in four key words: "Be Green. Save Green," which the designers seized upon and maximized to draw visitors into the pavilion. 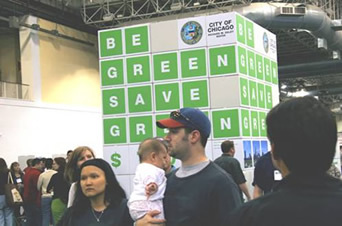 A record 35,000+ people attended the 2008 Chicago Green Festival. With "Be Green. Save Green" serving as a beacon in the exhibit hall, the city's message reached thousands of festival attendees. The city's return on investment includes using the "Be Green. Save Green." theme to promote the "$800 Savings Challenge" piece of its Chicago Climate Action Plan -- helping consumers cut costs and greenhouse gas emissions. The pavilion copy won an Eco Award for Excellence in Environmental Communications, an Apex Award for Publication Excellence and a MarCom Creative Award. Read the Chicago Green Pavilion copy. Read about other Terracom projects for the Chicago Department of Environment.